Wow, so the LA Marathon was a blast! Not my fastest time, but I think this is the most fun I’ve had at any of my 6 marathons! Talk about amazing spectators, volunteers and organization. As soon as I finished I couldn’t wait to run it again next year, talk about the perfect redemption race after a wet and cold DNF at the same race in 2011! I’m still not over that gold sparkle skirt. Totally in love with it. Going into this race I was excited but also just kind of wanted it to be over, I think in the back of my head I was still a little upset about Tucson, it was also supposed to be a HOT day and we all know I don’t run well in the heat. 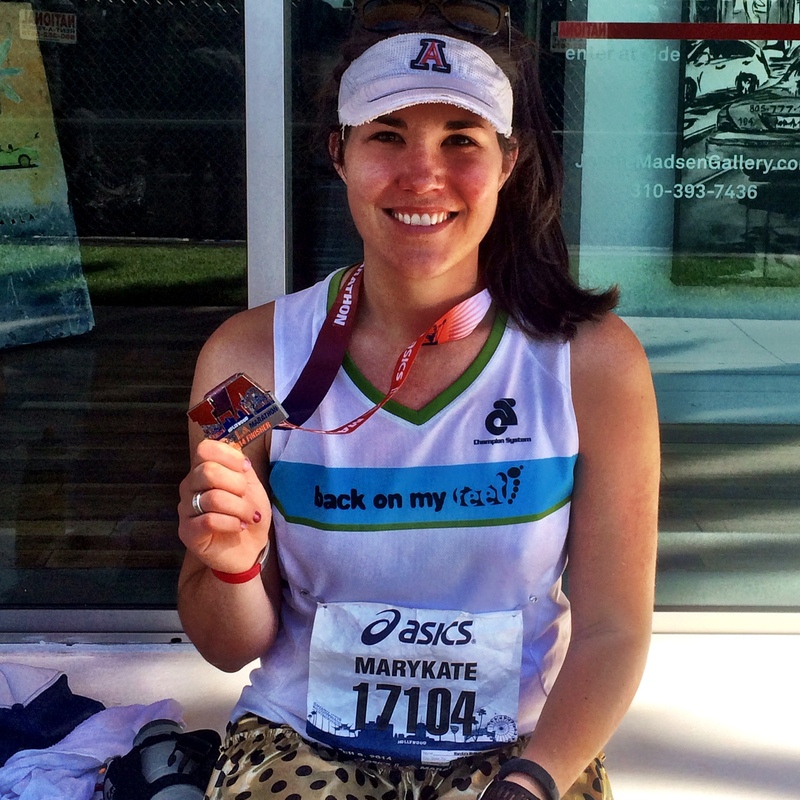 Running for BOMF helped me remember I was running because I can, and that I’m lucky to be able to even run a marathon! I went to bed as early as I could Saturday night knowing the clocks were going to jump back in the morning and I’d be sleepy no matter what time I woke up. 5am came not so bright, but very early and I pulled on my race outfit and checked to make sure my fuel belt was packed with everything I needed. BF took me over to our friends house across town so she could take me and her fiance to the race. Dodgers Stadium is about 30-45 minutes from Long Beach and with a little aggressive LA driving she got us there with perfect timing! 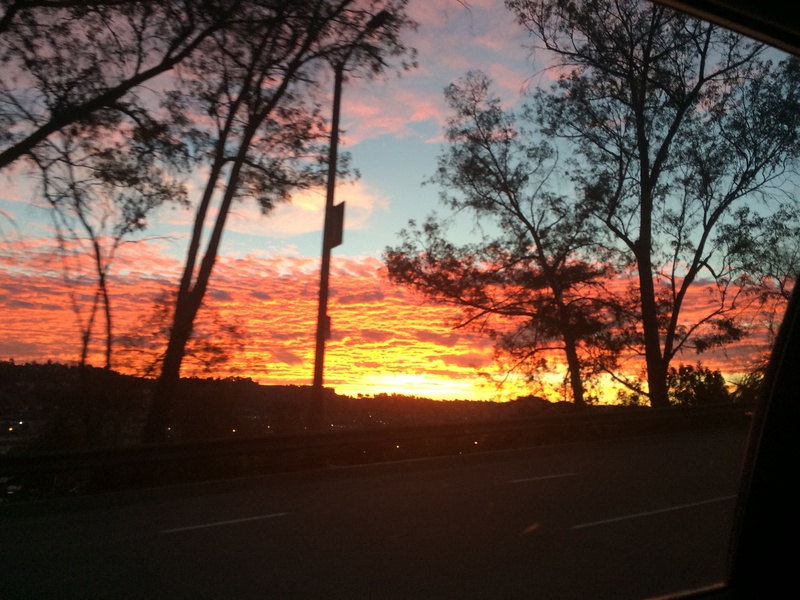 Good morning from Dodger Stadium! We hopped out of the car, snapped a few pictures and were soon lining up at the very crowded start. As soon as the very botched National Anthem was done the gun went off and we trotted towards the start. The first mile was sloooow. It was SO crowded I ended up running a 10:30 mile, which in hindsight was totally fine since I have a attendance to go out way too fast. It really didn’t feel like it thinned out until mile 3-4, but the energy of everyone around me was so great I barely noticed! I was cruising along until I hit the first hill at mile 5, it hit my quads hard but I kept pushing along trying to make up time on the downhills. At mile 6 people were handing out chili dogs! I was tempted but felt it was a little early in the race. The weather was literally perfect for the first half, I was happily cruising along, probably a little faster than I should of been, but I was having fun! I took my first fuel around mile 5 and every 5 miles after that a mix of Jet Blackberry GU (my new favorite) and Clif Bar Shot Blocks, I popped a salt pill before the race and every 5 miles also. I started out with Nuun in my water bottle (I love carrying my bottle for a race it helps me drink enough) but I’d fill it up with course Gatorade/water throughout the race. I found the fizziness of Nuun makes my water bottle leak and I’ve had a few too many close calls with my phone getting wet/sweaty since I hold both in my hand. Mile 10 my shuffle decided to quit on me, I was so glad I had my phone tucked in fuel belt so I didn’t have to run sans music the rest of the way! I took my first walk break to make the switch and then just cruised along past the closed bars and clubs basking in morning light. Each mile was coming and going and I tried to keep my sub-nine pace but by mile 15 it was starting to get warm. I took a port-o-potty break in West Hollywood and tried to get back in the zone for the late teen miles. Mile 17ish, see that guy with blue shorts? We started together & I no idea the whole race we were so close to each other! 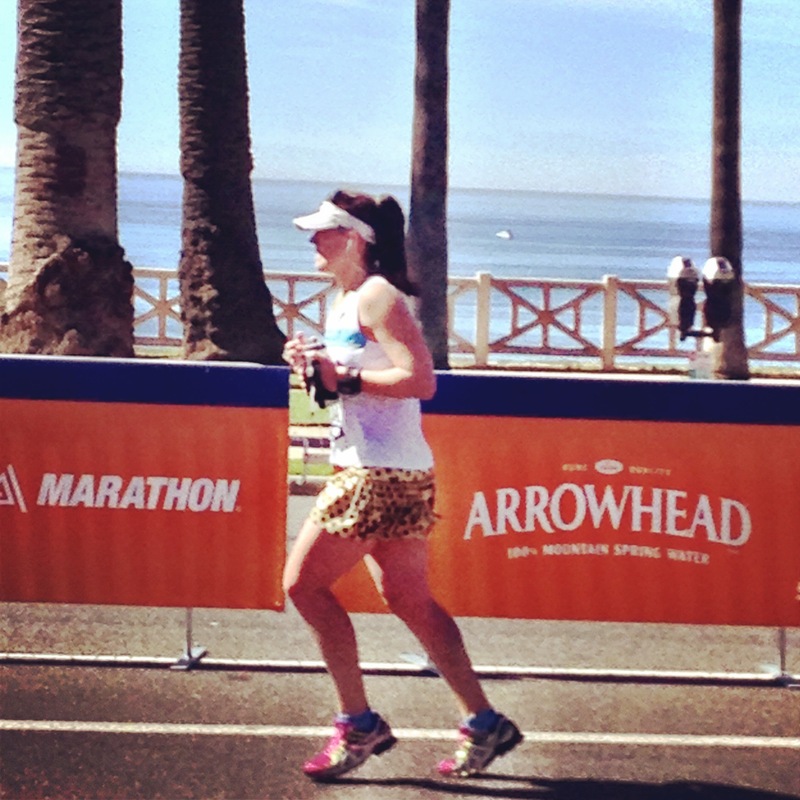 Remember the Long Beach Marathon, when I got such a bad leg cramp around mile 20? Yup it happened again at this race, I’m pretty sure it’s the heat that just zaps me and my muscles. Even though I took 4-5 salt pills I could still feel the cramp in my quad coming on at mile 20, I think it was a combo of both the heat and hills. The course turned onto San Vicente and got much shadier which was definitely a relief. Mile 23 I got a really amazing surprise! Some of our friends who lived in Huntington Beach at the same time we did moved to Santa Monica and came out to cheer for me! They even made me a sign! I saw the sign and thought, “oh hey, someone else named MK! OH WAIT THAT’S ME! 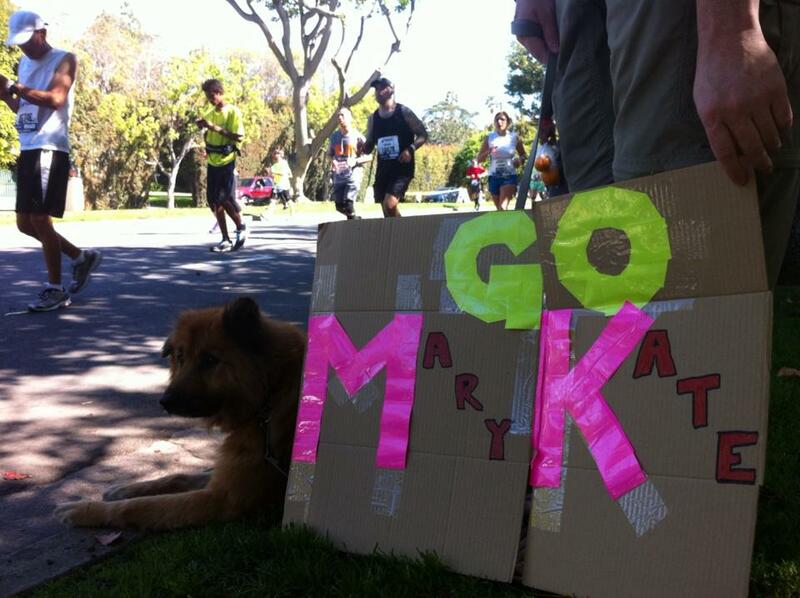 !” Then on top of that awesome sign and friends to cheer for me, mid way through mile 23 was also the BOMF cheering station! High-fives from all the guys was so great! Cheers and signs make me happy. It was seriously the best, I wish i could say it gave me the kick I needed to put it in gear for the last three miles, but that quad cramp was giving me a lot of trouble by this point. I knew I just had to do my best to get over that finish line! I had to stop/walk/stretch a lot just to keep going. It was especially frustrating because I honestly felt great and could have kicked if my quad had let me. I really need to solve that issue so I can finish stronger! Seriously you guys are the best! I was trying my hardest to run and push the last two miles, I wanted to run sub 9’s for the last two miles but the cramp in my quad was just not going to let it happen. I had to walk/stretch a few times, and I was SO glad to see the finish line on the horizon. I couldn’t even sprint to the finish my leg was on the verge of tightening up so badly, but I crossed that finish line as strong as I could and gladly hung my medal around my neck! I was so overwhelmed with the vibe and spirit of this race, I don’t know if everyone felt this way, but man, did I have a great time running this race. 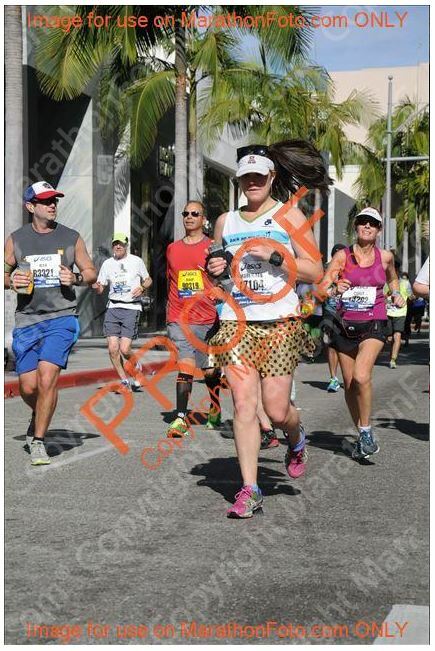 Oh, and LA Marathon if you’re reading this, those ice towels at the finish line were seriously golden. Every hot weather race should do that, totally clutch. BF made me look good in this picture, not like I was dying with a quad cramp. I learned a lot during this race too, and I’m so pumped to run another marathon to test somethings out. I’ve learned that I go out waayyy too fast, and then just lose steam at mile 20. I think slowing down, running conservatively maybe 9:15-9:30 pace for the first half and then picking it up for the second half to run negative splits would serve me better in my goals. I also know, that I need to push more during long training runs. 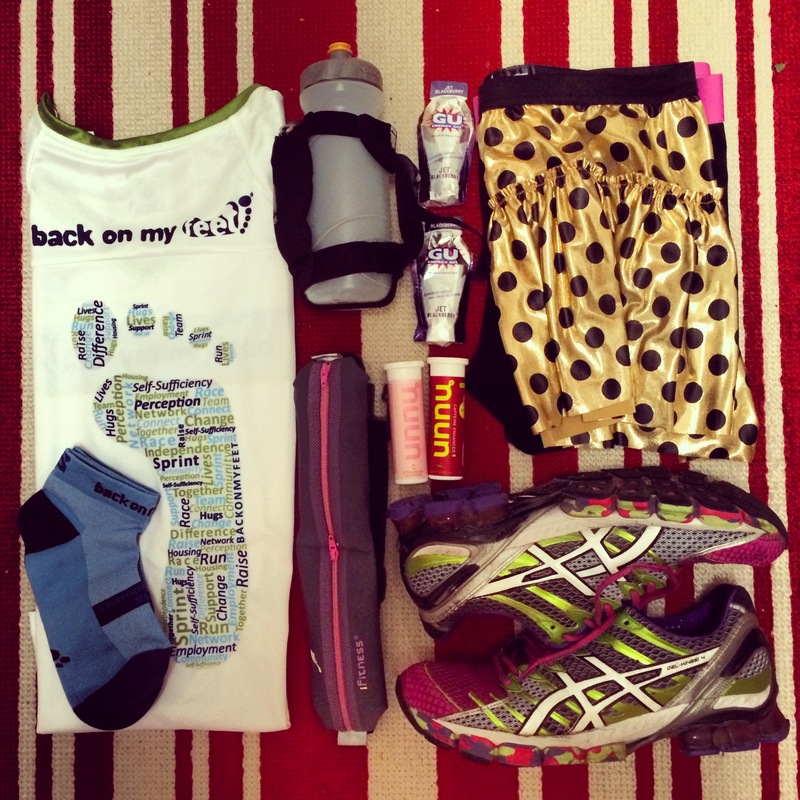 I tend to stop to stretch during long runs and I unfortunately think that it’s hurting me during the marathon. It’s not like I’m going to stop during a race to stretch! Going into the race I kept telling myself this would be the last marathon for a while, but all last week I was dying to pull the trigger on another race. The San Luis Obispo Marathon and the San Diego Rock ‘n’ Roll are the next two closest to me so we’ll see! I have to convince BF to let me! Otherwise it’s working on my half marathon times this summer and focusing on Long Beach in October. I really think breaking 4 hours is possible at that race, consistent training and smarter race strategy will be key! Until next year’s LA Marathon!